At the beginning of 2018, PlayFull invited you to consider these twelve practices to have a more PlayFull year. 5. Practice wholly (holy) listening. 7. Remember to rest; enjoy Sabbath. 8. Give and receive grace. If you like, you are welcome to download our printable and put it someplace as a reminder of healthy personal and relational habits. To help you, here’s a short thought on hospitality by PlayFull's president, Troy Cady. In 2010, my family moved to Chicago after having spent 12 years serving in ministry in Europe. As I write this, 2017 has come to a close. Seven years. It seems to have gone by in a flash. Seven years…and so much has changed. And yet: the work we started so many years ago in Europe has continued without us. To be sure, some of what we did has stopped, but some of it has continued in surprising ways. That’s humbling. I say that because I am aware I spent so much time and energy on teaching, managing conflict, organizing, setting up programs, devising strategies, and crafting action plans with deadlines. I labored so hard those many years on all those well-meaning approaches, and the one thing that truly stuck was, quite simply, the practice of hospitality. Wow! That is truly humbling. My wife teaches me a lot about hospitality. She says that it’s different than “entertaining guests.” Hospitality is about companionship. It’s about helping others feel at home, emotionally safe, accepted and at-ease. Believe it or not, I think of hospice care in connection with this. We think of “hospice” in our culture as a place where a person can die in as peaceful an environment as possible. My grandmother received in-home hospice care when she was nearing the end of her life. I was at her bedside when she passed and I remember how peaceful her passing was. Yes, it was a sad time—but it also holds many sweet memories for me. I remember singing cherished hymns for her and just being present with her, even when she couldn’t reply. It was enough to just be present. All genuine hospitality is like that. When genuine hospitality is offered, people are not afraid to hide the many ways they may feel “dead” inside. They can be themselves. Genuine hospitality is not dependent on a physical place. It is an emotional space. It is a space of acceptance: you don’t have to be someone you’re not. It is a space of belief: “I see so many wonderful things in you and I just love visiting with you.” It is a space of shared joys and sorrows. It is a space where strangers quickly become friends and friends become family. When we have people over to our house, we don’t feel compelled to have everything neat, orderly and planned. We don’t do everything for “guests” because we don’t do everything for friends and family. Instead, we ask them to help: that’s what friends are for and that’s what family is all about. 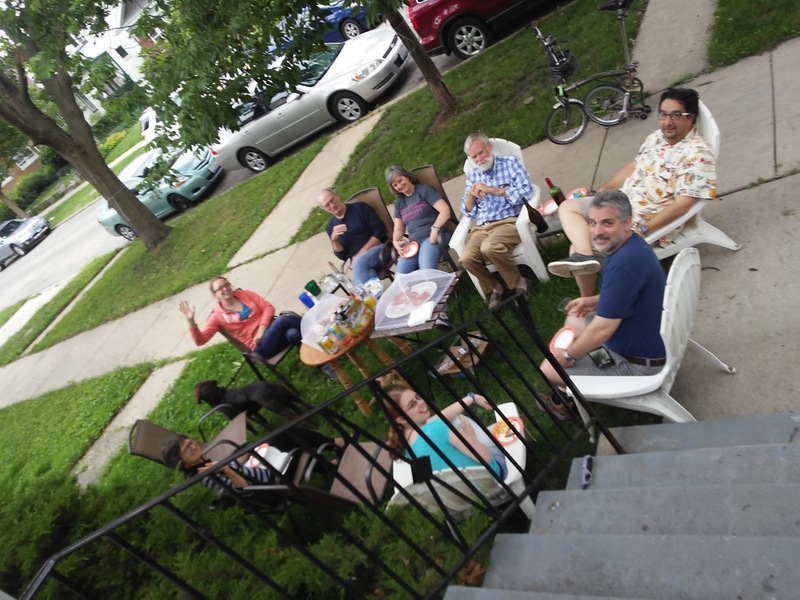 We put folks to work…putting out plates, utensils, glasses, and napkins…cleaning up, sharing food & drink. This kind of hospitality stems from something that’s quite obvious: genuine togetherness can only be created together. Because of this, hospitality can take place anywhere: in a large home or a small apartment, in a restaurant or bar, at the park or zoo, in your front yard or back-alley garage. It can entail simply playing games, sharing a drink, and having good old fashioned conversation. Invariably, laughter breaks out. Genuine hospitality is spontaneous; it occurs organically. It often involves food but it doesn’t have to be fancy. Even a package of chips (or some vegetable nibbles) and a pitcher of water will suffice. You don’t have to be wealthy to practice hospitality. In fact, I have seen first-hand that the company of the poor makes for the richest company. That first Friday a good group of neighbors spent all evening just enjoying being together and we carried on until 11 p.m. From one week to the next, the size of the group varied and the amount of time we spent together varied but with only a couple of exceptions we were out there every Friday. Everyone would bring food and drink to share. Because we were all right next door, we’d run in and out of our homes to get things we needed like cups and plates, chairs and napkins. One neighbor got in the habit of making homemade pizza for everyone and he did this almost every Friday throughout the whole summer. Young and old gathered and people brought out their pets. At one point it looked like we were holding a dog convention! I read stories to a couple of kids who came and helped another young friend make chalk drawings on the sidewalk. Everyone was different from everyone else and that is precisely what made our time so rich together. These times together made me realize that it is not often people spend time together just to enjoy each other with no agenda and no task to accomplish. It was refreshingly playful. Because of that, it was the time of the week I looked forward to the most. It was like a little slice of heaven on earth, in fact. So, we are planning to do it again this year. Practicing hospitality is the art of making space for everyone to bring their gifts to others, whether those gifts are physical or interpersonal. I wonder: how do you offer hospitality? 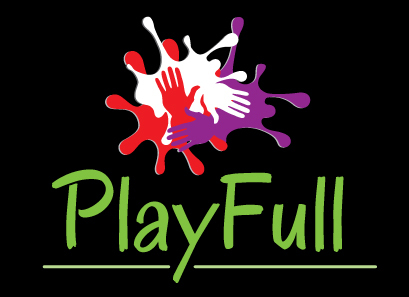 You can also like PlayFull on Facebook or follow us on Twitter to stay abreast of uplifting content.